Initially Tom Joad was a character out of John Steinbeck’s novel The Grapes Of Wrath (1939). In 1995, Bruce Springsteen released an album called The Ghost Of Tom Joad. In 2006, a Münster based post punk band decided to call themselves after that album. I was afraid that they would head into the same folky direction like the Boss from New Jersey, but Ghost Of Tom Joad succeed in bringing fresh air into the German indie scene. After their debut EP Is This What You Call A Fronterlebnis, the band quickly received offers to open for popular acts like Kettcar, Maximo Park, Tomte, Muff Potter and Coheed and Cambria. This indicated already what to expect from Ghost Of Tom Joad who haven’t reinvented the wheel with No Sleep Until Ostkreuz, but that wasn’t necessary after all. Apart from the silly intro and the boring outro, the band plays wonderfully arranged indie pop songs that may sound a little trendy at times, but are charmingly accessible. Especially Köln - Brüssel - Paris is a sure hit. Ghost Of Tom Joad prefer to rock, but there are also a few noisier passages, and they also don’t do without some quiet moments, and spice everything up with a decent dose of brit pop. You could compare their music to Jimmy Eat World and Robocop Kraus, although Ghost Of Tom Joad sound pleasantly fresher. 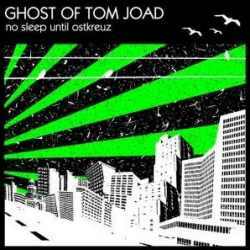 Ghost Of Tom Joad play exactly the kind of indie rock that can fill the dance floors of alternative clubs. Without reinventing the genre, they do their thing with determination and fun which prevents them of sounding like a copy of some other band. The future looks definitely bright for the three-piece.